This feature article has been written by Ralph Windsor, editor of DAM News. In the last year, there have been subtle but potentially significant changes to the positioning of some participants in the DAM market. A number of those on the sell-side, especially those in the enterprise segment have started to refer to their products or services using the term ‘content’. Part of the reason behind this comes from end users who have started to acquire a better grasp of how the pieces of their puzzle should fit together (even if not necessarily how to achieve that objective). They are asking difficult questions of vendors, particularly around how to implement the required logistics to better ensure that digital assets are distributed to other solutions and business processes. I believe the answers they are being given by the DAM industry are the wrong ones because of a combination of hubris, a lack of understanding of the nature of the problem and a conflict of interest which encourages the promotion of solutions that are monolithic and poor value for money. This speaks to an underlying attitude of arrogance and complacency that has been allowed to develop and which could predicate some more seismic changes in the DAM market that many are not fully prepared for. In this article, I will analyse two fundamentally different routes to addressing the limitations of current enterprise DAM solutions, indicate which one I think is superior and offer some strategy suggestions for users to help them plan where to go from here. What Has Gone Wrong With Enterprise DAM? Based on the above, a glittering career as the author of best-selling business novels may not await me (and I can’t say it’s a genre I have a great deal of enthusiasm for anyway). You should not need a qualification in English literature, however, to spot the circular nature of the plot. The last paragraph, especially, is a rough approximation of what I hear from many enterprise DAM users these days. Although there have been a lot of architectural revisions to the underlying technologies used to implement DAM interfaces, most software still looks and feels the same now as it did 15-20 years ago. You get the search field, the grid of thumbnail results and then a feature with a name like lightbox, collection etc which you can use to store ad-hoc selections of assets. There have been extensions to these three basic elements (and this description excludes anything about the metadata or cataloguing side of the equation) but from the average DAM user’s perspective, they are all supporting acts. In 2002, if I had been shown practically any DAM system available in 2017, it would look remarkably familiar. Yet another round of application re-branding will not hide (much less resolve) the issues faced by enterprises. Most have not only exponentially larger collections of content-oriented digital assets, but also an array of tangential logistical challenges to ensure the right material gets to whoever (or whatever) needs them. The thinking and the ideas required to come up with solutions to these problems is what is fundamentally lacking in DAM at this juncture. This is something of a problem in a market which you could characterise as being an ‘imagination-free zone’ where fresh ideas are usually in short supply and everyone just copies each other’s homework. Many of the themes with DAM software in 2017 have echoes of ECM products in 2005. This is why enterprise DAM vendors (and those who aspire to join them) have now started using the term ‘content’ to refer to their products. Winding the clock back and metaphorically pretending that we’re all still in 2004 or 2005, however, is utter folly, in my opinion. Those who pursue this strategy are doomed to repeat the same mistakes that caused lots of disillusioned ECM users to seek out alternatives to begin with. I do not believe that a sufficient number of DAM users are going to put up with this to sustain a market for these products over the longer term. Many of the purchasing authorities are more technologically savvy than their counterparts from a decade or more ago. Blind acceptance that this is how things are done and that six or seven figure budgets are necessary ‘to do the job properly’ are increasingly a thing of the past. There is going to need to be a lot more than just a change of wardrobe to convince enterprise users that the DAM technology choices currently on offer can deliver a satisfactory ROI. If a re-branded ECM is not the answer then what is? Based on discussions I have with clients now, what enterprise DAM users want is more akin to a transport hub like an airport or station that connects digital assets to the right destination. As I will explain, however, that comparison is not the whole story. The premise behind many DAM initiatives was originally about having a central location where the business could store digital assets and retrieve them. This period of DAM (which we’re still in now) is like building a warehouse but then failing to provide adequate connections to allow digital assets to get in or out (much less organise them efficiently when they arrive). In short, where DAM systems were originally meant to alleviate digital asset supply chain bottlenecks, now they have become one themselves. As alluded to in the fictionalised quotes earlier, the nature of the bottleneck is typically interoperability – or the lack of it. Not enough is going in, nor coming out and on to where it should go to at anything like a satisfactory level of throughput. This is why the users are getting frustrated. As I discussed in my article about digital asset supply chains recently, there are two ways to view bottlenecks, on the one hand they create inefficiencies which cost the business time and money. On the other, they can also be where the most potentially profitable value gets generated. Thus the point of all supply chain management initiatives is to remove the inefficiencies while preserving the value. The DAM software market has effectively stalled while bottlenecks have slowly developed. The realisation that there is a problem has only begun to emerge and get discussed more widely in the last few years. There has not been, however, any corresponding attempt to continuously improve processes for end users. My earlier comparison with airports or train stations could suggest that some large-scale expensive software solution which promises to offer everything that an enterprise would require is in order. That would be the wrong conclusion, but it is the one many are now being asked to entertain. The consensus I am finding from enterprise DAM users is nothing like that, but instead a desire for leaner, smarter vendors who are able to provide efficient control systems to coordinate this activity, not a pile of redundant functionality they are unlikely to ever use. Most enterprises (certainly those of a significant size) want to control their supply chain, but this does not mean they are willing to hand over large sums for someone else to go and do it nor buy up lots of non-core businesses that might only offer tenuous or temporary value. What they want is to have the flexibility of building their own product, but without all the implementation cost and complexity. It’s less about vendors who can produce yet more bloated products that aim to cover every single possible user requirement minus one (i.e. the one they currently need most of all) and more about a strategic ability to help them implement a digital asset supply chain as flexibly and cost-effectively as possible. As has been observed in the past on DAM News (and elsewhere) the major components that DAM vendors depend on to deliver working product are usually not built by them now. This has become even more prevalent over the last 10-20 years and the idea that vendors might implement their own database engine, for example, is absurd these days, yet it used to happen quite frequently. This is one of the reasons why there are so many DAM products on offer, because both the ingredients and the instructions to bake the cake are widely available at no or very low cost. In the case of nearly all the ‘innovations’ introduced by vendors in the last few years, someone else has provided the technology which they rely on and usually they have simply appended it to an increasingly over-burdened DAM application stack. A common theme for the development of most technologies (especially software-oriented ones) is giving users the ability to more flexibly configure product themselves. This involves reducing the complexity so it can be handled by someone with far less technical skill (and preferably none at all). While they might not care to be hands-on with the task, my reading of most enterprise DAM users is they want this flexibility with their DAM solutions. Rather than having to prepare lengthy RFPs that cover every single scenario and over-paying for product features they might never use, they want to be able to pick and choose the components they need on a case-by-case basis. Further they would like the option to change their mind and call components in and send them away again as required, only paying for the ones they use. Software development teams are keen on using terms like ‘agile’ to implement applications. More end users want to do the same with the scope and configuration aspects of their solutions. An alternative description to ‘agile’ which has a similar but less IT-specific meaning might be ‘Just In Time Functionality’ and this is the era in DAM that I believe we are about to enter. 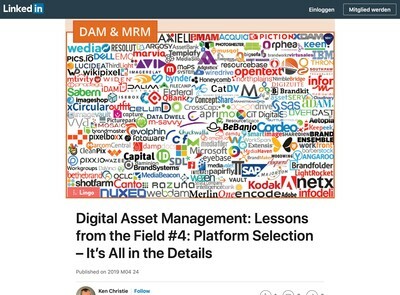 As I have just described, DAM users want to be able to drill down through the digital asset supply chain and gain greater control over their digital asset operations. The need to do this is based on demands from their own customers (internally and externally). The role of the software vendor as provider of a self-contained product which they exclusively control and make decisions about is likely to end because it is not a very responsive nor sustainable arrangement. 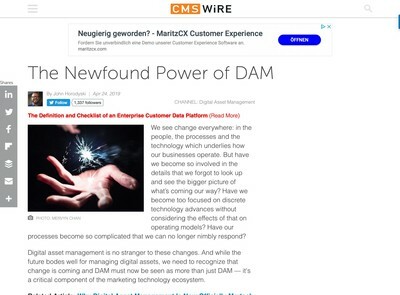 Adding further layers of functionality and expanding the scope of what is provided to try to cover all bases isn’t answering the problem and this is why many of the recently enlarged DAM platforms with an ECM identity crisis could fall by the wayside. The days when you go out and look for a product, organise demos, issue RFPs, choose a vendor to get hitched to and then repent at your leisure need to be over and done with now because this model of implementing DAM solutions has been comprehensively proven to be unfit for purpose. The first point should be obvious enough from everything that has been mentioned so far. The more processes that get replaced with digital alternatives, the more likely it is that a supply chain emerges which might be almost entirely digital in nature. Cloud infrastructures have wider implications than many in the DAM industry have yet to fully understand. The early stages of the Cloud were focused on reproducing existing server platforms to create a kind of virtualised server supermarket which tech vendors and IT departments could use to avoid the capital expenditure usually associated with buying physical kit. A lot of the DAM systems I look at which describe themselves as ‘Cloud-based’ still operate in this manner and cannot properly utilise many of the scalability benefits of the delivery method. The second phase is to package application components as self-contained entities or services that can be composed in a more or less ad-hoc manner. A lot of the components and services used by many Cloud DAM applications are delivered in this way now – the DAM system is essentially just an intermediary or data logistics expeditor. Microservices have been discussed on DAM News previously. This is the software or functionality side of the technology infrastructure referred to in the last paragraph. In simple terms, this means functionality can get packaged up and offered using a standardised contract or protocol. 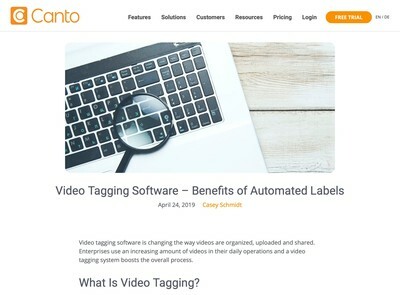 The range of capabilities offered is diverse but covers many of the core elements of DAM: for example image conversion, video transcoding, workflow etc. Amazon, Heroku and various others have employed a model which is similar to the one used by e-commerce stores where they leverage their channel and allow third parties to use it as a route to market in return for a cut of the revenue. The amount of effort involved to use and configure most microservices is still too complex for DAM users without any technical skills, but by pre-selecting a few, rationalising the settings and providing a lightweight user interface, it would not be that difficult to achieve. I have spoken to a number of people from different backgrounds including more forward-thinking vendors, consultants and some in-house IT personnel. All are aiming to create something that either is a DAM platform (or can act like one for a given task) but which is built entirely from these ready-made components. The results are currently unlikely to be as cohesive as dedicated DAM products built specifically for that purpose (for now) but they will cost a lot less and usually can be assembled in a much shorter period of time. This one area where innovation certainly is happening and at a rate of progress which should not be underestimated. The key differentiator underpinning these methods is that they are bottom-up rather than top-down. Instead of making a significant up-front investment into a given platform and then hoping it will achieve ROI, solutions built using this way can be implemented incrementally and using just-in-time principles which are more responsive to business needs. From a risk management perspective alone, this method offers some highly compelling advantages. The two important pieces of this kind of solution are the interface (or ‘user experience’ if you prefer) and the series of components which add value to create digital assets. This mirrors the strategic concerns that modern enterprises worry about the most: their brands and their supply chains. If you take the view that digital assets have now become integral to the successful operation of organisations in the 21st century (as I do) it is both unrealistic and unreasonable to not expect them to not want far greater say over how they are managed. They are increasingly unlikely to tolerate being given a black box offered by a vendor and then either have to wait for them to get it to work as they require it and have to pay them substantial sums to adapt and integrate the solution with other tools they use. While all this flexibility sounds ideal in theory, there are risks and they should not be dismissed lightly. The biggest of these are related to application ownership. If you purchase a conventional software product from a vendor, they assume responsibility for all their decisions usually both prior to deployment and afterwards (assuming a support agreement exists). If there is a move to a market where the users can control which components they use, ownership of the application and responsibility for the decisions made about it transfers back to the user. This means any conflicts, incompatibilities or integration issues become their problem also. For most software products with an active support agreement, when something goes wrong the vendor is required to fix it. If an application assembled from integrated Cloud microservices fails then whoever is paying the bill for them must deal with individual service providers, isolate which one is faulty and issue support requests or find replacements etc. The solution to mitigate these risks could take the form of an appointed management company who earn a fee for keeping these components running and providing the necessary maintenance. The digital asset infrastructure and connectivity is owned by the business and they can influence what happens to it (including replacing the management company if they wish). This might describe what a number of current DAM vendors will ultimately end up becoming. At present, the idea that you can divide the implementation and maintenance aspect of DAM solutions to use different providers for each just isn’t practical, however, I can see that changing. Anyone who lives in an apartment block (or knows about how they are managed) will be aware there is usually a management company who look after the building, even though they are unlikely to have originally constructed it. As such, this multi-provider model is not without precedent and arguably it will become essential as the solutions get even more sophisticated to cope with all the different requirements that users have of them. At present it is difficult to recommend that enterprise users make significant investments into DAM solutions because in my opinion, those being offered are bloated, inflexible and do not represent satisfactory value for money. One other buzzword used a lot by many vendors is how ‘disruptive’ they are, however, by my assessment, they are likely to be the ones who are in-line to see their business models disrupted next. With that said, these changes have yet to fully manifest themselves. If you are a DAM user frustrated with the tools you have currently at your disposal, it would be better to allow time for the ramifications of what I have described to play out before committing substantial sums to buying systems which might end up being outmoded and comparatively inflexible shortly after rollout. If you have no choice, I would limit the expenditure as far as possible by favouring simpler or cheaper options and avoiding long-term contractual commitments. Where do assets enter the business? What processes and people use them? Where do digital assets leave the business? What other systems or technologies are involved? What are the bottlenecks now? Are these related to the limitations of the system or are they the result of some other aspect (like poor quality cataloguing leading to unsatisfactory search results)? The answers to the above should pose yet more questions themselves, however, this is also what DAM users have to come to terms with. To avoid repeating the fictional dialogue from earlier in this article it is necessary to have an awareness of what you want to achieve and to avoid trying to seek out the holy grail DAM system which will answer your problems. There is no DAM platform which will satisfy all your needs – and there never will be. The way in which DAM solutions will get implemented in the future is more likely to acknowledge this reality (and be better for it) but this, in-turn, places greater demands on end users to have greater awareness of what they wish to achieve and in what sequence. This is the management trade-off that DAM users must face: greater control implies greater responsibility. 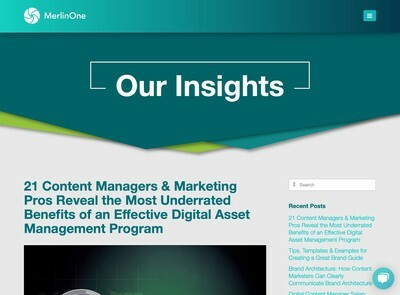 As much as the era of the monolithic stand-alone DAM system is likely to end, so too will vendors being the sole scapegoats for all that might be wrong with your Digital Asset Management initiative. Great article and some very interesting points. Would many of your points/concerns about the current state of digital asset management apply to video I particular? Although there has been a lot of progress in solutions for content creation and delivery (streaming, etc. ), video remains itself difficult to search. There are few effective tools for creating summary clips or helping people find relevant content. Given the growth in content, would such functionality provide value? Yes, they would apply to video also, I don’t think the media type (in the case of content-oriented digital assets) makes a huge amount of difference. On the value question, probably, but I couldn’t give a generic answer. It’s less about whether or not a given type of digital asset would provide value. That depends on the intended users and whether they would find video of value (so it’s context dependent). This article is more about how solutions are implemented and the digital asset supply chains necessary to support that process. I think the frustration and “dead-end” represented here about the DAM market is simply due to the lack of understanding of the limitation of taxonomies and meta-data as well as the wide spread confusion between files and assets. Taxonomies are jails for assets as very well explained in the article and without the concept of semantic relationship a DAM is a really boring piece of software that very quickly becomes more an impediment.